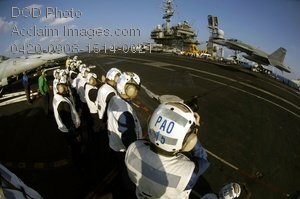 Description: Free, public domain image: Japanese Military Crew Observing Operations on an American Aircraft Carrier. PHILIPPINE SEA (Nov. 15, 2007) Japan Self-Defense Forces (JSDF) personnel observe flight operations aboard the nuclear-powered aircraft carrier USS Kitty Hawk (CV 63). The ship is participating in ANNUALEX 19G, the maritime component of the U.S.-Japan exercise Keen Sword 08. The exercise is designed to increase interoperability between the U.S. and JSDF and to increase their ability to effectively and mutually respond to a regional crisis situation. U.S. Navy photo by Mass Communication Specialist Seaman Kyle D. Gahlau .